Description: Sexes similar. 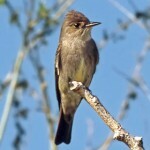 Olive-brown above; light throat and yellowish belly; darkest on head; and pale olive wash across breast. Lacks conspicuous eye ring, and has two light wing bars. 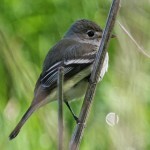 Habitat: Found in edge habitats such as thickets or groves with small trees and shrubs that are surrounded by grasslands. Often found in riparian areas, such as early successional willow thickets along rivers. 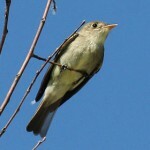 Where in Nebraska: Common spring and fall migrant, and uncommon to rare summer resident statewide, rare in the southwest. 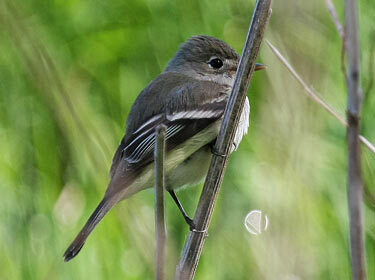 Fun Facts: The Willow Flycatcher songs are innate, not learned like those of most songbirds.